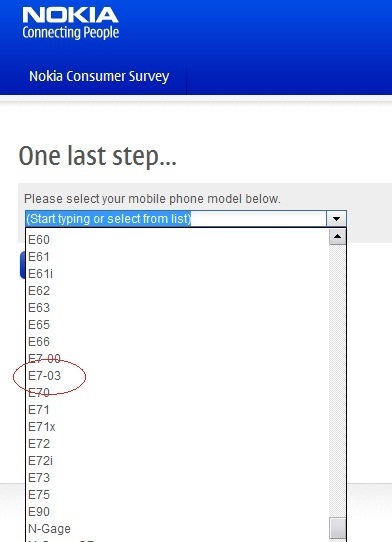 One of our readers was kindly filling out a Nokia Survey and towards the end he saw an option in the drop down that took his attention. Underneath Nokia E7-00 was Nokia E7-03. What might this be, huh? We’ve seen future unannounced Nokia’s pop up accidentally before on lists. Just yesterday on Nokia Conversations the leaked and unannounced C2-05/C2-06 got accidentally put on an image at Nokia Conversations yesterday. It may not be simply a local variant like the C7-00_01 (Astound). I wonder what changes we can expect. Cheers Adam for the tip!